Jake Salnen awoke to find himself trapped under a pile of debris. He managed to free himself only to to discover the remote surveying compound where he worked had been attacked, and all his fellow personnel are now missing. Injured and alone, Jake searches the abandoned camp for answers, but may be unprepared for what he'll find. Leave a comment and I'll return the favor. 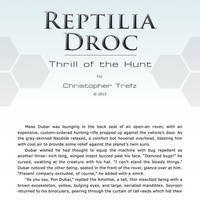 Visit my web site www.reptilia-droc.com/ for more in-depth articles on the Droc universe. Interesting story, got your feedback on the note and thanks for the ideas. Amazing....very well done. Excited to read more. Wow, that was really awesome! And nice layout too! Thanks a lot, glad you enjoyed it! How do you get your stories to look like that? Also, fantastic work. 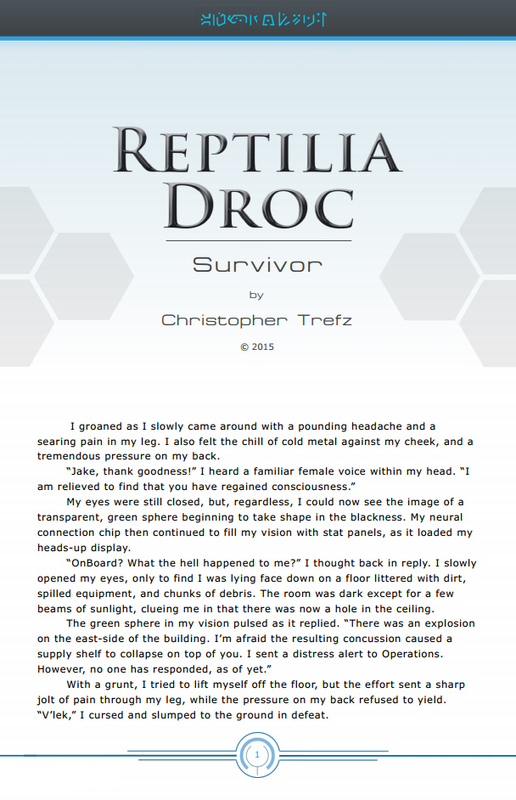 After I wrote it in word, I brought the story into a layout program called Indesign. It makes it a lot easier to format and add graphics. Then I exported it as a pdf to post. My day job is in graphic design. 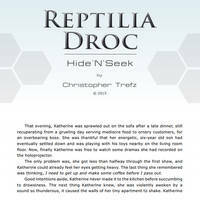 Checking Inn Naga Chapter 1"H-Hungry...." Audrey whimpered, laying face-up on the ground in the middle of some dense forest she got lost in. Not a very good place for a human to get lost in, especially when there wasn't much to eat and you're stuck going in circles in that same area. Not to mention all of the dangerous animals that loved to eat humans. "I can't believe this..... I'm supposed to be a genius but here I am...... on the verge of dying without anyone knowing..... no one to help..... I always though I would live a full life before dying....." she stares at the blue sky overhead, somewhat dazed after losing all her energy to move. Drachenfutter (Contains: Vore)A Word of Caution: As the title indicates, this story contains elements of soft vore (an act where a living being is swallowed whole and alive by another), along with some suspenseful situations. If you follow me by this point this should be nothing new, but if you stumble upon this from elsewhere, please be aware of this before reading. If you like vore, then by all means, enjoy the story. If you don't specifically care for it, consider yourself warned if you do choose to read anyway, though I hope that the story itself should be something to appreciate anyway. If you outright hate the concept, then don't complain to me if you choose to read further and don't like what you see. Drachenfutter (German): An idiomatic expression, translated as "dragon's food"; the phrase refers to a gift one gives to a romantic partner that they know is angry with them, with the intent to try to patch things up. Orphaned in FelaryaA loud series of tree branches cracking filled the night air of felarya followed by several screams echoed. A family of five had just woken up to find themselves placed high in a large tree, the shock causing them to fall through the branches and to the ground. Luckily for them, they weren't too high up to begin with and laid on the ground in a moaning heap of parents and children. Kirt, the father of this family, sat up and looked at his wife and three children in concern. "Everyone alright?" He said in a grunt, trying to mask his pain and fear as it was he who had been the cushion that had broken everyone's fall. He was a muscular man with brisled brown hear and cared more for his family than anything else, even his own life. In relief, he saw his family sitting up, moaning and complaining, but alive none the less. The King Without A NameThe council ordered him killed. That’s something they will never be able to justify, but it will never make them evil. After all, at first, I wasn’t sure if I should kill him, either. He was only 11 years old when I first met him, in the tunnels below. Oh yes, I see the surprise on your face… I’ve been to hell, friends. I’ve visited the Dark Under and seen the one whose name is not spoken, I’ve stared him right in the face and stayed sane. I’m an Elf, we have different standards of sanity than you humans do. I was not alone when I met him, no. 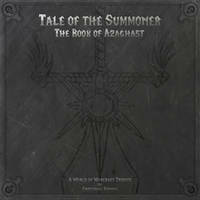 I was with my closest, my dearest friends – Nerkom the Sorcerer and Vi the Radiant. Ah, I see you know those names. Yes, yes, I am Mikhal. No, I chose to forgo a title, and I am fairly certain that by extension I am wanted by the council as well… but that is neither here nor there. No, we are in no danger here, I promise you. Shall we continue with the story? Better Late Than Never I walked down the sidewalk with my hands in my jacket pocket and my headphones in my ears. It's a surprise I never get run over while coming home from school, I rarely take my eyes off the ground as I trudge through the town. The only time I look away from the concrete, is when I look to my right as I pass by the High-grove Cemetery. I'm unsure of why it is, but cemeteries consistently attracted my attention. I always found their atmosphere and scenery beautiful. Even walking through a place of sadness and death, I found some kind of lifting spirit there. The way that nature takes over the area is beautiful. When I Picked Dare. I sat down between my friends Ashley and Leah. We'd been at this party for about 3 hours and it was getting close to midnight. Half of the party decided they wanted to play Truth or Dare, while the other half stayed outside in the backyard. Swimming, singing, and dancing to whatever trash rap music was playing. The party didn't end till about 10am due to people having to stay the night for being too drunk. We were teens, but we were responsible for each other when it came to drinking. For example, Leah and Ashley were drinking, and I was the designated driver. I didn't mind, I didn't even like the taste of beer, I drank wine coolers instead. Just not tonight, I held off so the 3 of us would get home safely. Science Fiction of the Most Disappointing OrderOne day I sat at my listening post in SETI, drinking coca cola, eating chips, and making jokes about what aliens would say if they actually saw my fat lazy coworkers and I, when an extraterrestrial race contacted us in a series of beeps on our high-frequency radio. Needless to say, I nearly crapped myself in recording the message, for it was clearly binary and our autistic junior member to the team, a great big fat man with a neck beard who insisted his first name was Xoo (I think the real name was Dawson), immediately understood it. He began rattling off a list of simple mathematical equations, getting more and more complicated as it went on until we were certain the message was a list of coordinates or directions. Of course, by that point our superiors had crowded into the room, as had their superiors and a couple of government officials. In 2020, mankind had found itself on the edge of a major economic windfall following investment into fusion research. Before this time, the general and widely practiced form of energy was through the use of non-renewable fossil fuels, rather than renewable, clean, and dependable energy used today. On April 7th, 2020, the first fusion reactor, dubbed 'Helios' went online in Bristol, England. The power generated by this device was outstanding, able to rival that of the sun's. The Helios fusion core was kept in a constant near-absolute zero environment, which allowed the extreme temperatures created by the fusion process to be contained. The resulting energy was able to power all of the UK with a single reactor. The Kzin-Tzenkethi WarIn the early 2250's, Starfleet reports indicated the existence of a vast interstellar state in the outlying Western regions. No information was known on them, only that only two small entities stand between them and the Federation: the Kzinti Patriarchy and the Tzenkethi Empire. The Kzinti were dreaded as the natural carnivores of space, the only sapient species that sees sentient life as prey. Basically nothing was known about the Tzenkethi, besides that they were reptilian in nature, have a strict rank system and their technology roughly equals pre-Romulan War Earth. Section 31, the shadow government of the Federation wanted an alliance with the strong, martial-spirited Kzinti, so that the Patriarchy would be a Federation-supported buffer zone between the UFP and the percieved threat in the West: the Cardassian Union. The Blind Naga's HuntIt was a nice day outside when a blonde-haired girl named Bry decided to take a walk outside to enjoy the serenity of nature. She has a summer home in the forest where her only company outside was the sound of animals and the breeze that caressed her. Bry was unaware that she was about to have an unexpected event that day. Up above the trees, a winged elf stopped his tree leaping to see a woman walking down the path below him. A breeze blew through the feathers of his folded wings as he watched the woman. Intrigued, the elf began to follow her to see how far she will go, if not present a hunting chance for him. The girl soon stopped by the river to cool herself off and to drink, while the elf landed from his perch to present himself to the girl and said "Good morning miss"
Bry was startled by a sudden voice. But looking at the man, gained his composure. "Good morning to you too, sir" Bry said. Man ventures into space and visits the Earth's Moon. Various exploration vessels are sent to planets within Earth's Solar System. The Sky Union is formed and with it the foundation of modern temporal science. The first Tier (human genetically engineered to be smarter) is born. The first Tier engineers the second generation of Tiers. Cycles of mistrust, conflict and war ravage humanity as the full impact of Tiers to society is realised. Majority of African and South American continent along with low lying landmasses now inhabitable as Green land ice sheet disappears. Rusted Locks The bars clattered and I jumped, my breath snapping in my throat. I crossed my arms across my chest and drew my knees up to my chin, grit scraping against my rough-hewn pants. I squeezed my eyes shut and I imagined my lashes weaving together. What you can’t see can’t hurt you, right? I tried to tell myself. Another, muted, part of me laughed an absurd laugh, chastising my instincts. I strained to hear more, but the door had fallen silent. I slowly unfurled, slitting my eyes open. I could not register the strip of empty space between the door and its frame. I could almost feel the new air trickling into my cell, though in reality we were too far underground to actually have fresh air. The new space was only two finger widths wide, but it promised so much more.